I love spinning gradient yarns, and had another chance to indulge this hobby for a skill swap with a very talented knitter. As the yarn was created the colours spoke to me first of metal and then rust, merging into the colours of dusky rose petals. The gradient fibre set, from the very talented Hilltop Cloud, was called “Padlock”, so I named the yarn “Unlocked”. Leave the shelter of the homestead – hearth and warmth and family – and step over the threshold. Survey the garden wilderness, full of hidden nooks waiting to be found. Follow the path as it slowly becomes more and more overgrown. As what was open and passable becomes a natural obstacle course of leaves, twigs and fallen branches. A dead end? But, not quite hidden, a door, and hanging from it a rusty padlock hinting of past treasures once hidden from uninvited guests. Unused and ineffective now, you push the crumbling timbers of the door. Hinges squeak, grumbling at the call to action, and finally the sight, hidden for so long, comes into view: twisted, overgrown and thorny, but in bloom! Fibre: Merino, Bluefaced Leicester, Mulberry Silk. I’ve always loved autumn, and long associated the season with fresh starts, new beginnings and exciting adventures ahead. It’s the beginning of the academic year, so dominated my life for almost three decades. I still have fond memories of making my way to school at the tender ages of 4, 5 and 6, with the grey weather dominating and the september foliage defining the paths along the journey. The combination of these two fibres seemed to capture that memory perfectly. Walk out into the swirling mists of a Northumbrian autumn morning. Grey precipitation dances around you, jumping like jack frost to avoid the sun’s clarifying rays. Catch glimpses as the grey voile shimmers: a blackberry here, a rosehip there. Leaves! Some bold and ever green, some autumnal, curling and crunching underfoot. Breathe in the crisp air and feast your senses upon the delights of the season. As summer is put to bed, so the foundation is laid for new life. New beginnings. Autumn: the season of hope, of awakening. The time to embrace all the delights that nature offers, then return refreshed to the cosy fireside. Length: 455m / 498yd approx. Fibre: Grey Bluefaced Leicester, 21 micron merino (in “Giggleswick”). This was another of those projects where a customer asks me to spin their fibre, and when the fibre arrives it is stunning and plays so nicely whilst you draft and spin it. I loved the bright colours in this braid, and they got me thinking of the old meanings of flowers. 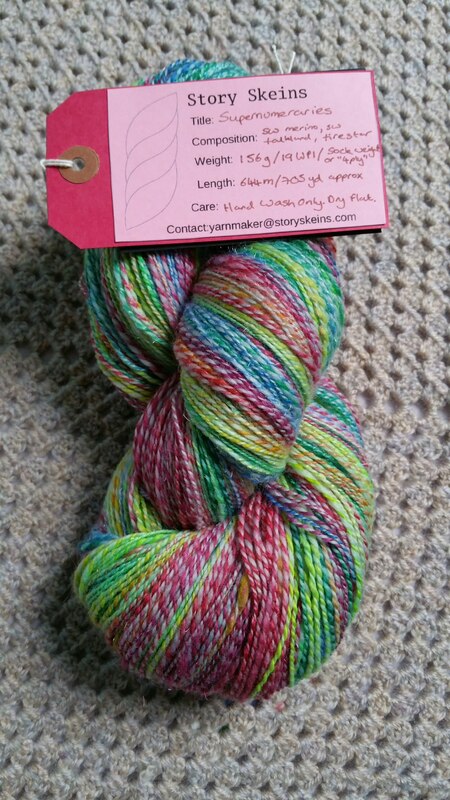 I wondered if the colours would lead to a description of what if feels like when amazing yarn arrives and begs to be shaped into a new creation. 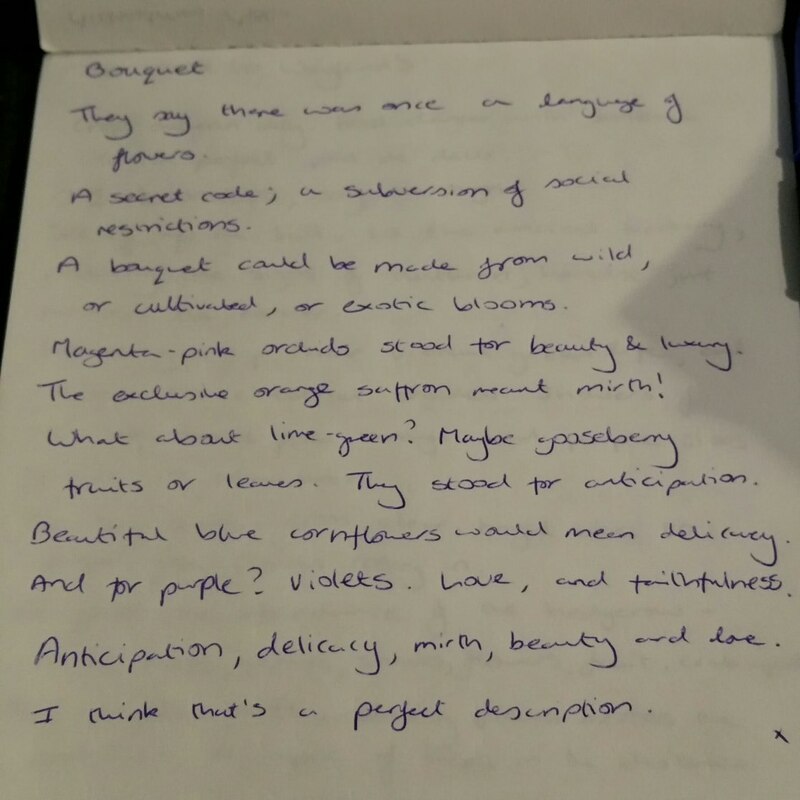 They say there was once a language of flowers. A secret code; a subversion of social restrictions. A bouquet could be made of wild, or cultivated, or exotic blooms. Magenta-pink orchids stood for beauty and luxury. The exclusive orange saffron meant mirth! What about lime-green? Maybe gooseberry fruits or leaves. They stood for anticipation. Beautiful blue cornflowers would mean delicacy. And for purple? Violets: love, and faithfulness. Anticipation, delicacy, mirth, beauty and love. Length: 681m / 745yd approx. I’m a big fan of skill swapping. For me it’s a win-win. For this swap I received the yarn I needed for a project and in return I got to spin this wonderful fibre! 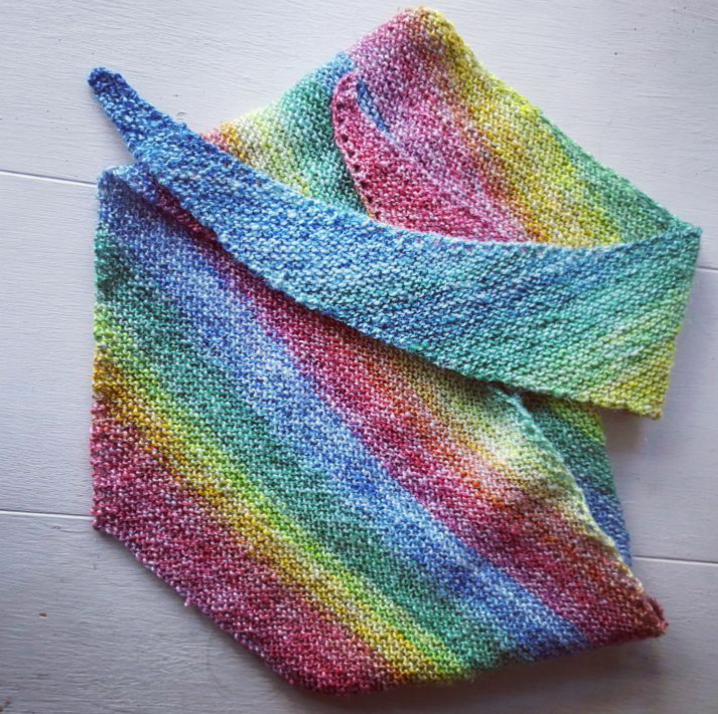 The rainbow rolags were from Blue Barn Fiber, a new maker for me. I decided to spin them one after another to create a repeating rainbow pattern, which inspired the name ‘supernumeraries’. 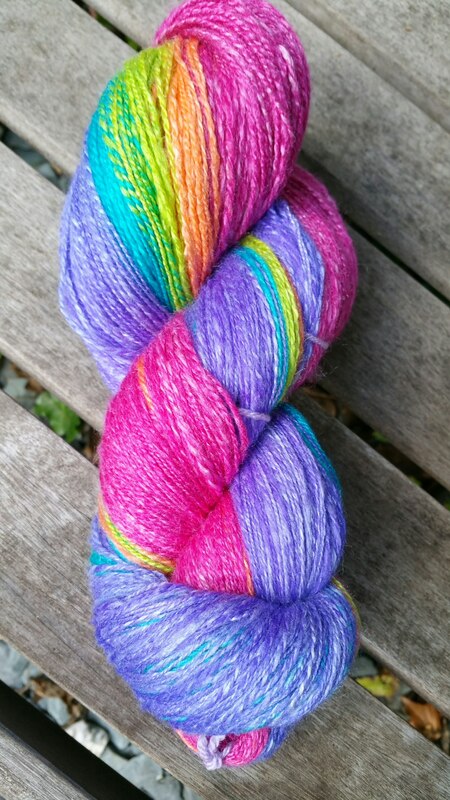 To bring out the rainbow colours I plied it with fine, soft, white Falkland wool. Sometimes seven stripes just isn’t enough. Supernumeraries – when the rainbow just doesn’t want to end. It’s one of many sky stories. Like auras, sun dogs, halos and the northern lights. 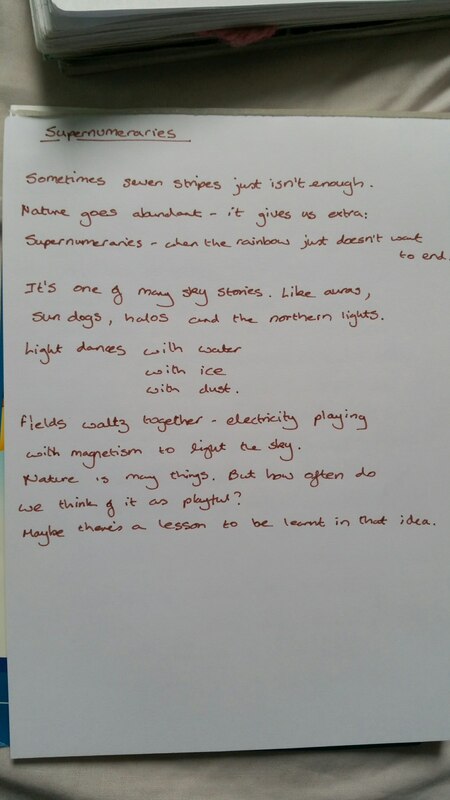 Fields waltz together – electricity playing with magnetism to light the sky. Nature is many things. But how often do we think of it as playful? Maybe there’s a lesson to be learnt in that idea. Photo courtesy of Hutch at Dye Candy. Composition: Superwash merino and firestar plied with organic Falkland. Length: 644m / 705yd approx. Fibre: Organic Falkland, superwash merino, firestar. Source: Falkland from Wingham Wool Work. Merino/firestar rolags from Blue Barn Fibers.